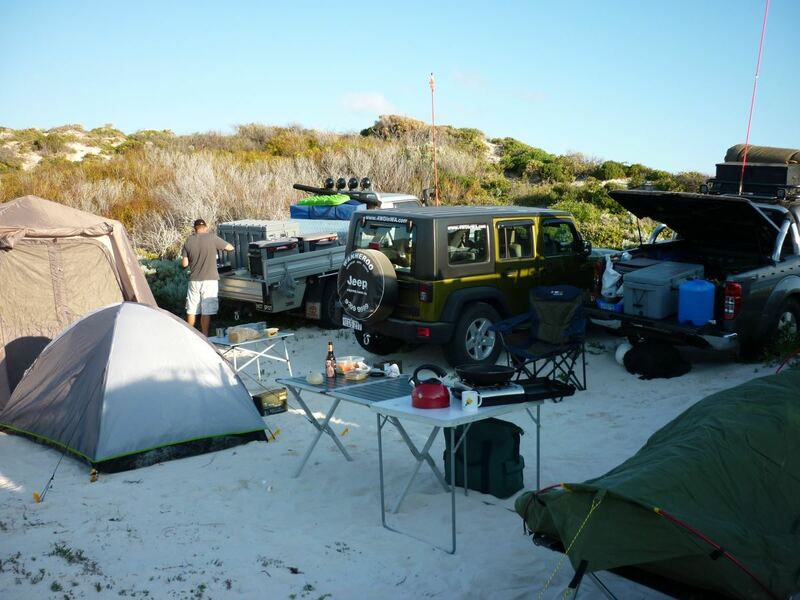 When camping in the bush or on the beach there will be no running water, toilets and showers. Keeping nice and clean is quite easy just over a few days, but when camping in these conditions for a longer time things can get a bit smelly, dirty and unhygienic. Don't let this change your mind on camping in isolated areas as there are plenty of ways around it. Always bring more water than required. That way you will always have some spare water for cleaning & washing. Also bring plenty of clothes, enough to allow you to get changed every day if needed. 12 volt camping showers are available at any good camping/outdoor adventure shop. Camping showers can even be mounted inside the engine bay of the vehicle providing hot water. The simpler solution is a shower bag, filled with water. You can hang the shower bag from a tree or a roof rack so the bag absorbs the heat from the sun. Simply stand under it and release the valve. DIY Hot water vehicle shower. For the ultimate of all shower options check out Jed Currey’s write up on a Do It Yourself hot water shower. These simple items will assist heavily in camping hygiene, ear buds, toilet paper, tissues, soap, disposable toothbrush/regular toothbrush and a small bottle of mouth wash.
Baby wipes are excellent for cleaning of hands, face and the rest of the body. Especially the "down under" areas, there is nothing that cleans better than those wipes. A dustpan and brush is one of the best ways to clean sand of the feet before crawling into the sleeping bag, mainly when beach camping. Multiple days of collected sand in a sleeping bag is not comfortable. Never go camping without a first aid kit; you never know when you will need it. Generally small cuts and grazes can be left untreated but that all changes when in the bush. In the bush or at the beach camping hygiene is paramount. Cuts and grazes should be kept clean at all times, all good first aid kits will have distilled water sachets, disinfection cream and/or disinfection wipes. Dettol is a great thing to add to the first aid kit. Use these to clean cuts and grazes. Close all wounds with bandages or band aids and change them every morning and night to prevent unwanted infections. This should keep you trouble free. Choose an area, a good 150-300 m from camp, for disposal of your human waste. Make sure you bury your waste at a depth of at least 300 mm or 30 cm plus (over a foot deep). The deeper the better, if in sand there is no excuse to only dig 30 cm. If holes are not dug at least that deep, wild dogs and other wildlife will dig it up. Whatever rubbish you bring into the bush must be taken out when you leave. If fires are permitted all paper rubbish can be disposed of over the fire before or after the cooking is done. Glass bottles weigh a fair bit compared to cans, this is the main reason most regular campers bring their drinks in cans. Bottles are also prone to breaking in the esky or fridge when 4 wheeling on the harsher tracks. When camping in areas that offer no running water, showers and toilets you could always break up the trip by staying at a caravan park (if possible) in between staying in isolated areas. 2-4 days on the beach/bush, 1 night at Caravan Park, repeated to suit. This will allow campers/travellers to use facilities and freshen up.